This Zucchini Dessert Crisp is a unique and delicious way to use up your zucchini! Zucchini is sort of like tofu and eggplant. It can stand alone and be great, or you can do a bunch of sneaky culinary magic to it and transform it into something else. Today we’ll turn zucchini into apples…pickle-looking zucchini apples. By adding lemon juice and sugar to thinly sliced zucchini then briefly cooking, you arrive at a flavor that is spot-on apples. Like if you closed your eyes you would think apples. But the acidity of the lemon juice turns the chlorophyll in the zucchini olive green so…yea they look exactly like pickles. But I PROMISE you, this is so good. With a crumble crust and a scoop of old-fashioned ice cream on top oooh Sugar Honey Iced Tea it’s good. You essentially cut up a few zucchini real thin. I don’t have many kitchen gadgets, but I do have a mandoline slicer. Did I remember that I had a mandoline slicer as I slaved over these thin slices? No. Then you’ll mix the zucchini slices with lemon juice and a sweetener (sugar, sugar-substitute, honey if you’re feeling adventurous), and cook over medium heat until the zucchini are soft. 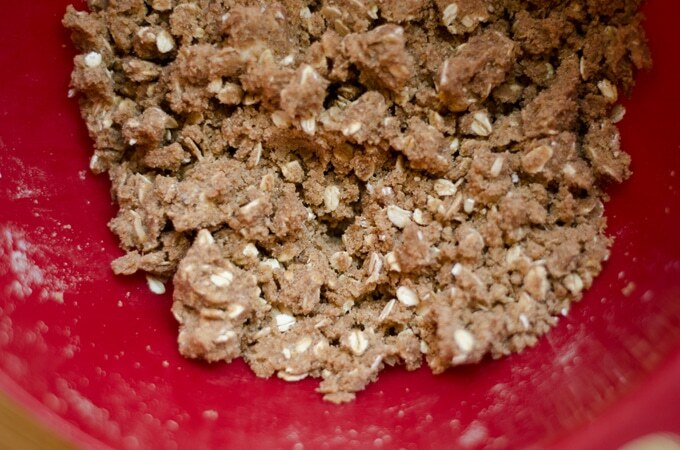 The crust is a simple crumb crust with some rolled oats thrown in (woohoo soluble fiber!). 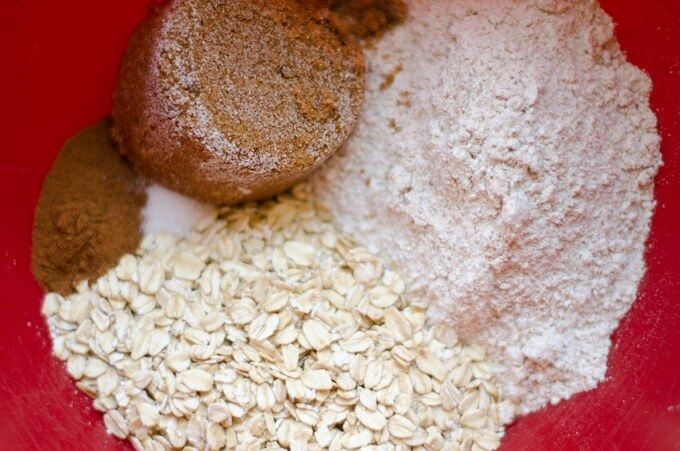 Cold butter, brown sugar, whole wheat flour, rolled oats, cinnamon, and salt. You can try to mix the cold butter in with a fork or other proper utensil, but it’s easier to just mash it all together with your hands. 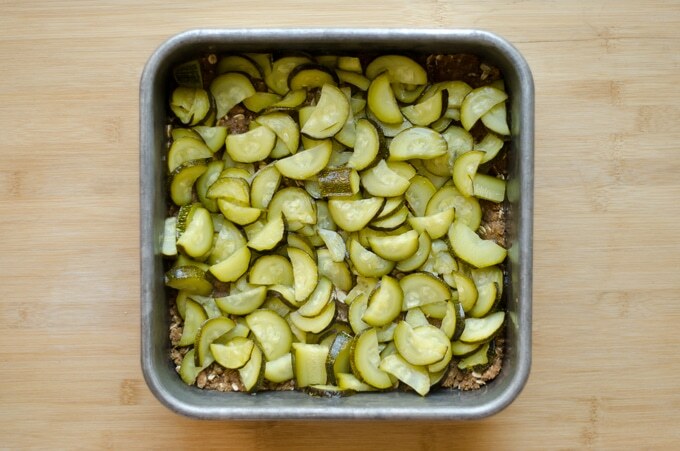 Then you just smush some crust into the bottom of a pan, pour the zucchini/apple/pickle-looking mixture over it, sprinkle some more crust over top, and bake. 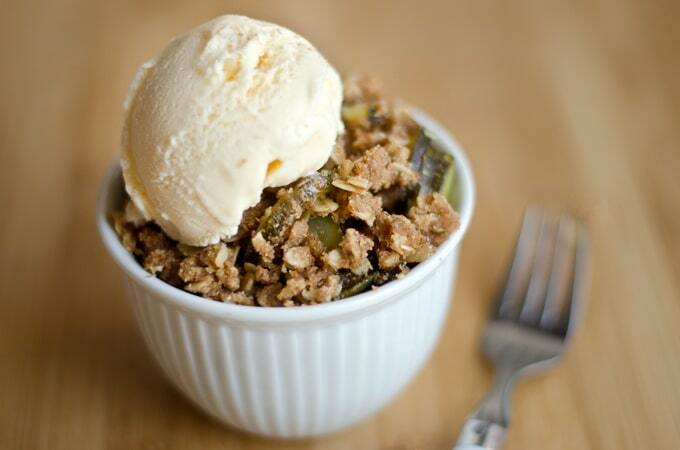 Serve this Zucchini Dessert Crisp warm with vanilla ice cream or like…eat for breakfast everyday for a week. 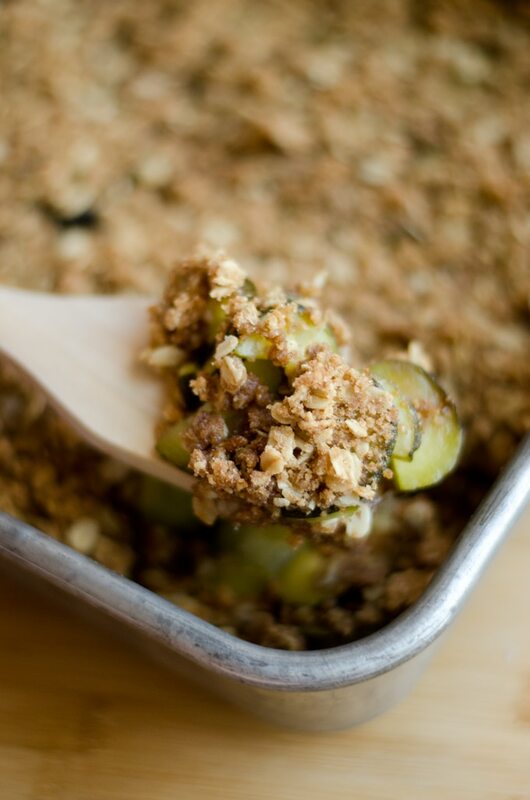 This Zucchini Dessert Crisp is a unique and delicious way to use up your zucchini! In an uncovered saucepan, bring zucchini, lemon juice, and sugar to a simmer over medium heat. Cook about 15 minutes, until zucchini is soft and some of the juice has reduced down. Mix flour, sugar, cinnamon, and salt. Add cubes of cold butter to flour mixture and blend with hands until evenly distributed. Dough will be very crumbly. Press half of the dough into the bottom of an ungreased pan (8x8 inch, 9x9 inch, whatever size you have). 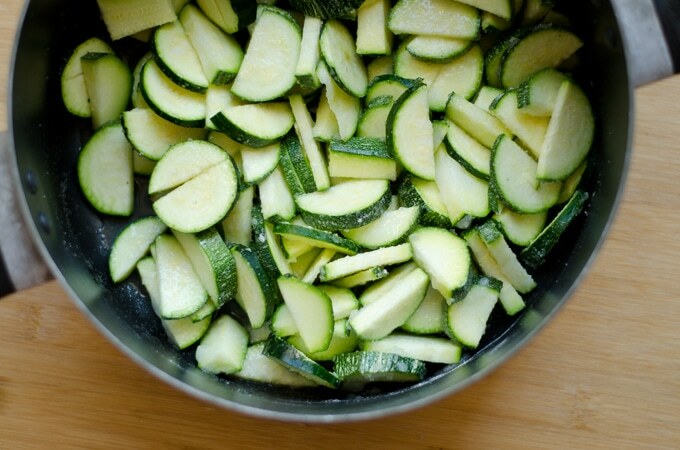 With a serrate spoon, remove zucchini from pan and place onto dough. Sprinkle with 4 Tbsp of the lemon cooking liquid. 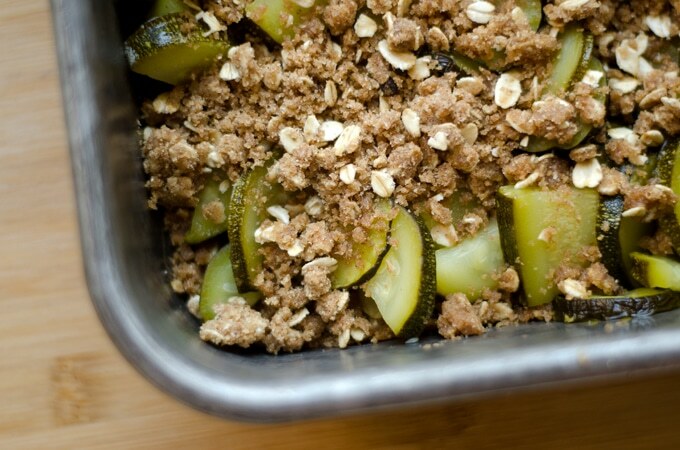 Spoon remaining crumb dough over zucchini. Bake at 350 degrees F (175 degrees F) for 45 minutes. For best results, serve warm with vanilla ice cream.